Want to try it on in-store? Make an Appointment or call 732.283.4999. Congratulations on selecting your wedding ring with Virani! To complete your request, fill out your information on the right and one of our associates will contact you in 24-48 hours. Speak to a representive anytime! Be the first to receive exclusive offers and sneak-peeks with a $25 off Promo Code! Store Locator_white Created with Sketch. Sign In_White Created with Sketch. 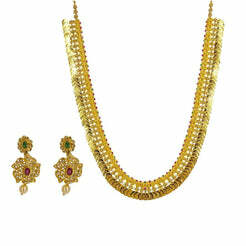 22K Yellow Gold Laxmi Arm Vanki Set W/ Ruby, Emerald & Cubic Zirconia Stones for women. 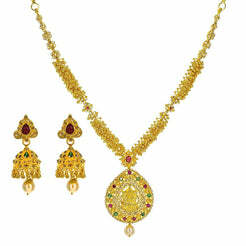 This stunning jewelry piece is featured with centered Laxmi and two peacocks on the side encrusted with rubies, cz and emerald as gem stones. Gold weight is 48.4 grams. 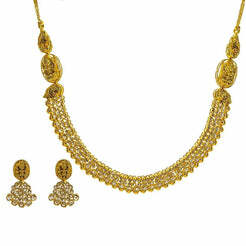 It is a beautiful piece for special occasions. Online orders are processed and/or shipped Tuesdays - Saturdays. We do not process or ship orders on Sundays, Mondays or National Holidays. Orders placed within this timeframe will be processed and/or shipped on the next business day. Orders placed within this timeframe will be processed and/or shipped on the next business day. All packages are shipped with through FedEx delivery services. At this time, Virani Jewelers does not fulfill orders outside of the continental United States. In addition, we do not ship to Post Office Boxes (P.O. Box). Signatured packages are available upon request. Please see our complete Processing & Shipping policy page for a detailed description of our process. Customers MUST provide the original purchase receipt(s) to exchange/return any item(s). Requests made without original receipt will not be processed. Items MUST be in the original condition in which they were received, including original Virani packaging and protective wrappings. Requests made for damaged/missing items will not be processed or processed with a restock fee contingent upon the extent of damage. Please see our complete Returns & Exchanges policy page to process your request. I would like to receive information from Virani using the information. Type the characters in the picture above. If you can't read them, submit the form and a new image will be generated.